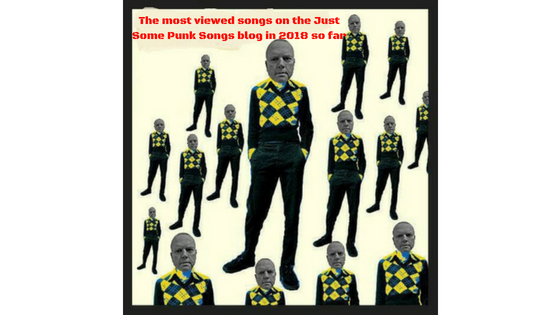 Just a quick update to thank the half a million plus of you that have clicked on a Just Some Punk Songs page (or maybe the one of you that's clicked a hell of a lot!). Hopefully you've discovered some awesome music. There's been plenty of great new releases so far this year and I was going to put together a special show featuring my favourite songs from the first half of 2018. But then I decided to make it your chart instead. So on Tuesday (26th June) at 8pm (UK time) I'll be counting down the Top 20 songs that you guys have clicked on during the year. I've no idea how many updates have been read by those of you that go straight to the title page and scroll down through the entries but I can find counts of page's visited and can therefore put together a pretty accurate chart. So if you want an hour of great music (with all the added excitement of a countdown!) either tune in on Tuesday (feel free to come in the chatroom and say hi) or wait till next Sunday when I upload the saved version to Mixcloud and then listen at your convenience (The shows now air on Hong Kong station Radio Lantau on Thursdays and Sundays so I have to wait to upload them). It's your chart so you know it'll be good. Tell your friends and lets get some great new punk bands an audience.